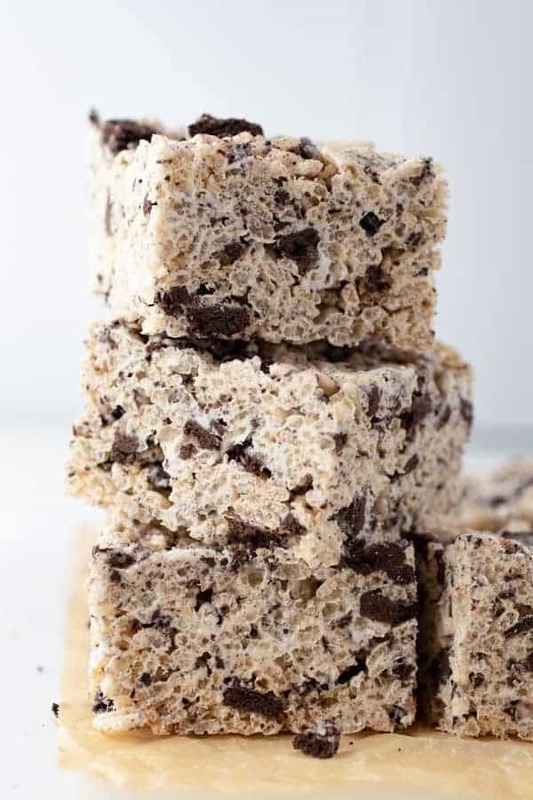 Cookies and Cream Crispy Treats are a fun twist on the classic. The addition of crushed Oreos makes a treat chocolate lovers adore. 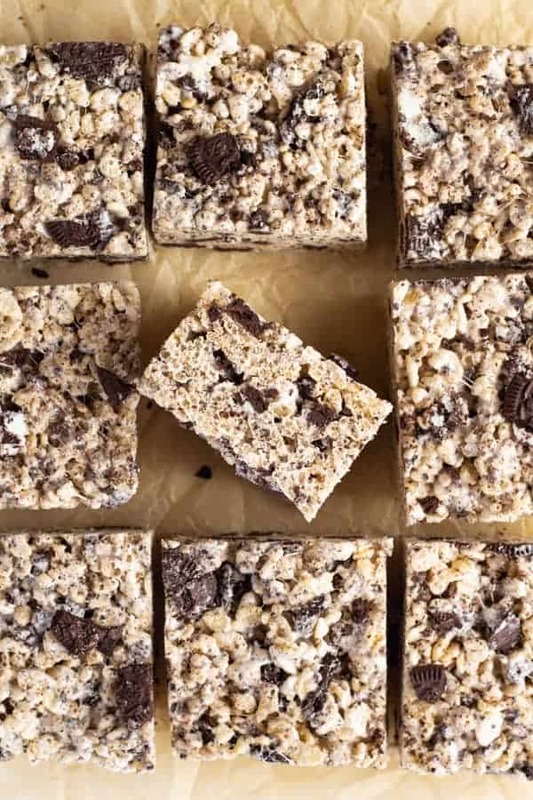 When it comes to classic no-bake desserts, you can’t do better than the rice crispy treat. A simple, yet perfect, combination of butter, marshmallows, and, of course, Rice Krispies. 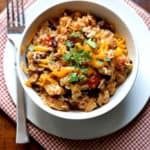 The recipe is perfect as written and it’s a perfect starting point for creativity. This “cookies and cream” version is one of my favorites to make. Like the original, it’s easy-to-make, you simply crumble a generous amount of chocolate sandwich cookies and stir them together with the cereal. Mini-marshmallows melt a little faster than their larger counterparts. Since overheating causes crispy treats to turn out hard and brittle, faster melting over low heat is an easy way to ensure the treats turn out soft and chewy. At some point, probably during the low fat craze of the 1990s, Kellog’s reduced the amount of butter called for in Rice Krispies. This was a mistake. The small amount of butter not only adds flavor, but it also makes for tender bars. It’s a sticky challenge to pour the melted marshmallows over a bowl of Rice Krispies. It’s easier to add the cereal to the pot of melted marshmallows. To do this, you need one thing: a big pot. A 5-quart pasta pot is perfect for the job. The mantra for making crispy treats: low and slow. Melt the marshmallows over low heat and stir slowly. This prevents the marshmallows and butter from burning–and the low heat keeps the bars nice and soft. Crispy treats are sticky buggers. To prevent the treats from plastering themselves to the pan, line your pan with two crisscrossed pieces of parchment paper. (For easy removal, cut the paper long enough that there are a few inches overhanging the pan. Then use the excess paper to lift the bars out of the pan.) After lining the pan with parchment, give the paper a light coat of nonstick cooking spray. It’s normal for some marshmallow and cereal to stick to the pot. After transferring the mixture to the pan, fill the pot with warm water. Let it soak for the bit. The water will dissolve the marshmallow mixture. If you need to wash the pot right away, fill it with an inch or so of water. Return it to the stove. Heat over medium heat for a few minutes. Empty the pot and scrub lightly. 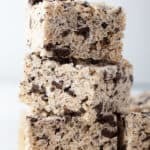 Crushed chocolate sandwich cookies add the perfect hint of chocolate to these marshmallow crispy bars. When crushing the cookies, crush them lightly. The easiest way to do this is to put them in a baggie and hit them a few times with a rolling pin. The cookies continue to break up as you stir together the melted marshmallows, crispy rice cereal, and cookies. Lightly spray an 8-by-8-inch baking pan with nonstick cooking spray. Line the pan with 2 crisscrossed pieces of parchment paper. 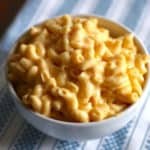 Leave about a 2-inch overhang on all sides. Spray the parchment lightly with nonstick cooking spray. Melt the butter in a large pot over medium-low heat. Add the marshmallows. Stir constantly until the marshmallows are completely melted. 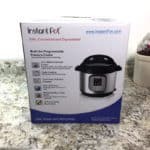 Remove pot from heat. Add the cereal and crushed cookies. Stir until combined. Allow the treats to cool in the pan for about 30 minutes before slicing into 9 or 12 bars.